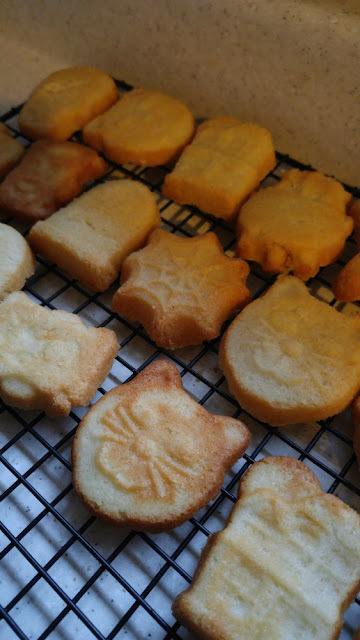 Instead of spacing out my Halloween baking this month I ended up cramming it all in last week. My carpal tunnel has flared up horribly over the last month and it's become depressing. I have things I want to bake and decorate but the idea of waking up every hour at night because of my throbbing hand discourages me. I try to baby it at home since I know work and sewing takes a toll on my wrist and hand. So I did all my baking last week when I had Adam around. He became my muscle to help me mix dough and break apart candy bark. This means I now have a refrigerator and freezer full of goodies. It's a good thing we had company up this past weekend and a party to attend to share some of our treats. Every year Adam requests these molded sugar cookies. The recipe calls for almond extract and it makes the cookies really good. 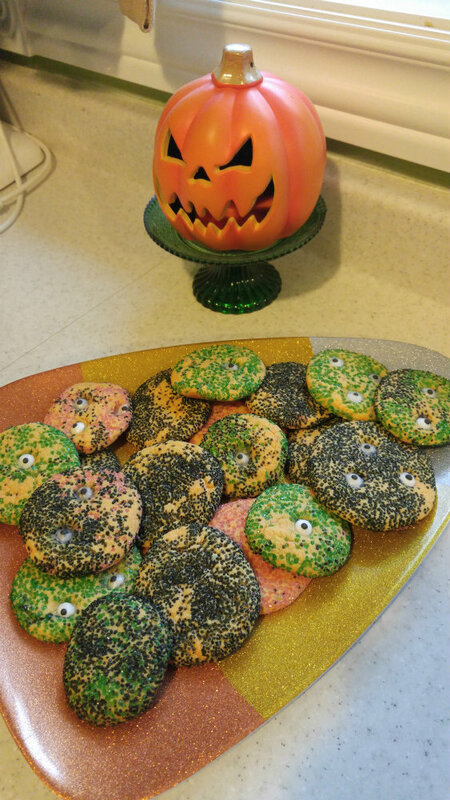 We made cake mix cookies and rolled them in coloured sugar for a Halloween party we were going to. It gave me a reason to pull out my edible eyeball decorations to make them Monster Cookies. 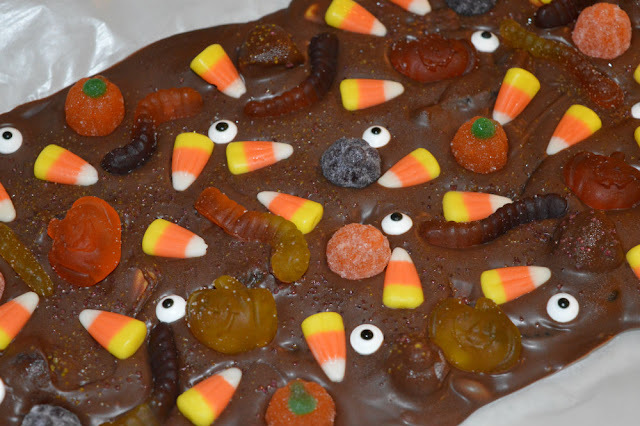 Of course I had to make a chocolate candy bark. I needed a reason to buy a mix of Halloween candies at Bulk Barn. 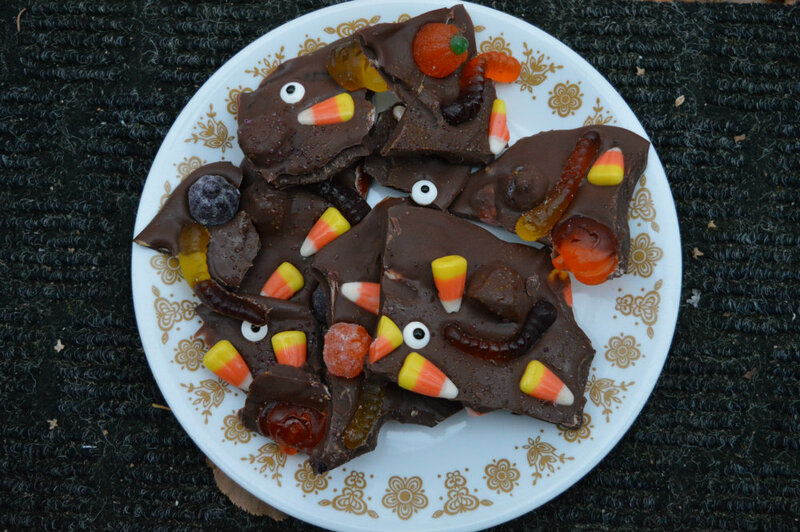 Did you make any fun Halloween treats this year? I plan on loading up my lunch box with some of these today since I will be spending Halloween evening at work.